Cask, Keg & Bottle; Regular. Our brand new IPA launching at The Pigs Ear Beer Festival. 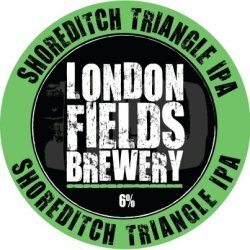 3 different malts and 3 different hops join together, inspired by the mystical Shoreditch Triangle lay lines. It will be a new permanent beer for us with the single hop IPAs taking more of a back seat. Bottle on train. Hazy amber. Nose is caramel, resin, orange. Tastes similar. Decent. Pours orange with white head. Aroma is citrus, orange, tropical fruits, some pine, floral and light sweet notes. Taste is floral, citrus, some pine, fruit freshness, a bit watery, some hay. Low carbonisation. Refreshable beer! Bottle from random shop on Kingsland Rd, London. BB 05.11.2017. Hmm, is this really retired? Pours amberish with small soapy head. Not pretty! Floral and sourish unripe tropical fruit aroma. Dry-rotten pine needles. Flavour likewise. Bittersweet. Lightish body, nearing watery palate. A really odd one. Seems old but I guess it really isn’t... No, not for me. Is this a bad batch or bad bottle? Weird! 33cl bottle. Pours dark amber with off-white head. Aroma - grass, pine. Taste - grassy, pine-y, very sweet - caramel, fruit cake - almost cloying. Bottled. An amber beer with a yellowish head. The aroma has notes of hops, spices, and caramel. The flavor is sweet with notes of malt, caramel, over ripe fruits, and hops, leading to a bitter finish. Cask in the Golden Smog, Stockton. Amber with a thin cream layer of froth. Not much in the way of aroma. The taste has some nice bitter hoppiness - spicy with pine and caramel. 33 cl. bottle. Hazy orange colour with an off-white head. Aroma and flavour of grass, hops, fruit, spice, citrus and bitterness. Sample from 33 cl bottle. Hazy, amber golden colour with a thin, off-white head. Fruity aroma with citrus, grasses, tropical impressions. Taste is bitter. Medium bodied. Finishes dry and bitter. Nice. 33 cl bottle. Pours hazy orange with a small white and creamy head. Aroma is greasy and solid hoppy. Smooth fruity, bitter and slight herbal. Solid hoppy. Dry, bittter and herbal far finish. Une IPA Classique à la robe ambrée, belle mousse crémeuse. Nez à la fois malté et houblonné sur des notes citronnées, pointe de mangue. Bouche droite, nette, tendue comme il se doit, fine bulle et finale amère.